* Other: Originally brewed as a winter ale known as Tournay de Noel. The beer was so well received that brewmaster Laurent Agache decided to make it a year-round brew. We nudged him in this direction too, of course. At 7.6%, it's a bit lighter than the original of 8.2% - all the better to enjoy in warm weather as much as cold. This was my winner at the last stout tasting. 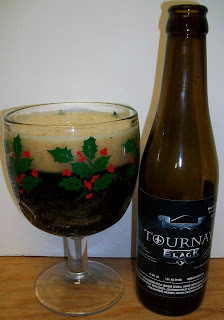 Since this was originally brewed as a Christmas bier “Tournay de Noel”, I thought I would use my Christmas Goblet one more time. Pours a dark brown almost completely opaque; there is just a hint of amber an amber hue at the bottom edge of the goblet. This bier also produced a fairly rich tan head. the bubbles in the head seemed to keep growing larger until it collapsed to just a heavy film with a ring around the glass. Ohhh what a nose! Dark roasted malts with dark fruit esters and that Belgian yeasty aroma. Wow this is my kind of a nose: Love Those Belgians! Wow, no I mean WOW! Really this is just amazing! I know I will not do this bier justice in my feeble attempt in trying to explain its elegance. This may be the most exquisite Belgian I have had so far. Let me attempt this description. Sweet dark roasted malts upfront with just a hint of some Belgian sour notes. The middle of the sip is incredibly malty with a delightfully creamy and smooth mouthfeel. There is no malt bitterness just a luscious malty goodness. The back-end and finish is exquisite. There is great maltiness with dark fruit notes, a slight hop dryness, all on the most exquisite yeasty background. This bier is smooth and delectable from beginning to end. I usually rant a little more, especially when I’m so infatuated with the bier but I’m left speechless on this one. The final sips of this bier were at 67 degrees and were just as amazing as the first, maybe even more so. This bier warmed so nicely. The bier really just got richer and smoother at the warmer temperatures. A+ until I decide if I’m going to do something like an O for outstanding.